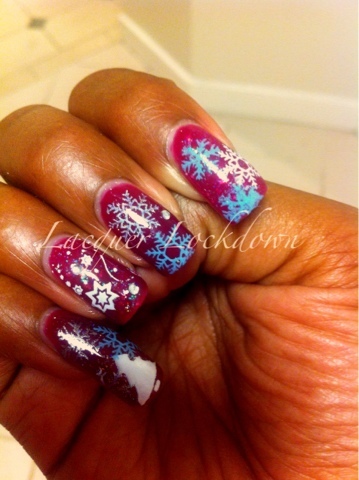 Lacquer Lockdown: Snowstorm Ahead...On Sundays I Stamp! Is it just me or are the days going by faster? Not a bad thing but it means things can sneak up on you. But this is a season for that though...carols, shopping, upping your OCD meds, you know the usual... ;); Lol well today I have another entry for my Adventures in Stamping challenge. 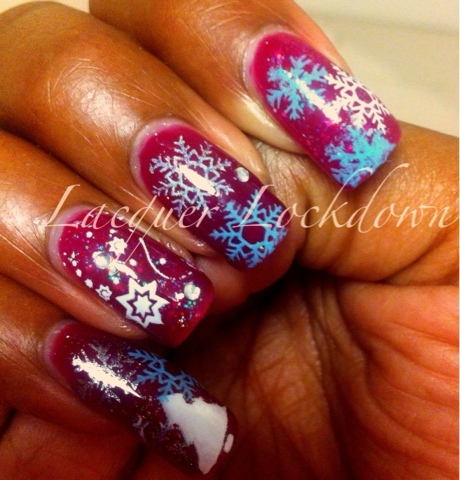 This weeks' theme is Winter Themed. I wanted to do a play on this challenge but I lost the sun and wifi. Honestly I've been holding back on doing something blue and sparkly for a while now but today I got an odd feeling of wanting to capture something different. Hey stranger !! I think this turned out great and I love it but you knew that already lol !! This is really pretty! I love that you did it over a jelly sandwich, I haven't seen that before!